Q: Why should I send my iPod / iPhone / iPad to you? We are one of the UK's leading non-warranty iPod / iPhone / iPad repair centres. We have been dealing with repairs on mobile devices for the last 10 years. 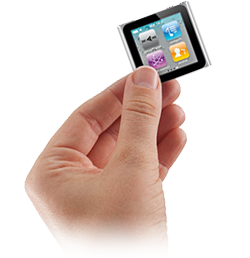 We offer a fast efficient repair service for all iPod / iPhone / iPad. Most iPod / iPhone / iPad repairs carry a 3 month warranty. Check Terms and Conditions for full details. Q: How long will I have to be without my iPod / iPhone / iPad while its being repaired by iPod Repair Center? Most repairs are carried out within 3-5 working days; some high level repairs such as liquid damage can take longer. We pride ourselves on our quick turnaround times. However, on some occasions our turnaround times can be extended due to a high level of repairs or parts availability. Q: I would prefer to bring my iPod / iPhone / iPad in person, can I drop it off? Yes, you can either drop it in and collect once it's ready. Our repair centre is in West London. Q: What is the procedure for sending my iPod / iPhone / iPad in for repair? First thing to do is to fill the the repair form on the website and print out the packing slip. Then package your iPod / iPhone / iPad well in a box or padded envelope. Make sure it's sent with an insured service. Once we receive the unit we will attempt the repair. If the problem is more serious than expected we may need to contact you to advise you of a new price, and get your authority to continue. If we repair your unit successfully then we will request online payment by sending you an email. If we could not repair the unit, we will request payment for the minimum charge and return the item (if you prefer we can normally recycle for parts at no cost to you). Once payment is received we will post the unit back to you using an insured, signed-for service. If you authorised us to recycle the unit then no payment will be required and the unit will not be returned. You receive your fully working unit back, and tell all your friends about our great service! Q: Will I still have my warranty intact? Q: What kind of parts do you use for repairs? Q: Do I get a warranty? Please check our Terms and Conditions for further details. Q: Will I get charged if you have quoted for a repair and I decide not to go ahead? Once we look at a unit we have a minimum charge which is to cover engineers' time and any parts used to attempt to repair the unit. Some repairs have a higher minimum charge due to the time we spend trying to fix the unit - e.g. liquid damage. NOTE: post and packaging is in addition to the minimum charge. We accept all major UK credit or debit cards as well as PayPal. If your coming to collect in person you can pay by cash. Payment by online bank transfer can be arranged by special request. Q: Will I lose any data from my iPod / iPhone / iPad? Q: If you can't fix my iPod / iPhone / iPad can you sell me another used or new one? We usually keep a stock of iPod / iPhone / iPads available for sale both in used and new condition. We may offer a discount of we can recycle your faulty iPod / iPhone / iPad and use the working parts. Q: When do I pay for the repair? Q: What is this "minimum charge"? We need to re-quote the repair and you refuse the re-quoted price. In most cases we will waive the minimum charge if you allow us to keep the unit for spare parts (i.e. we can recover our cost by using parts of your unit that still function to repair other units). Q: Why don't you offer repairs for the iPod Classic & Shuffle 1st and 2nd Generation models? As they are very old now parts are very hard to get for these early models.